The Renier team paid homage to Rose Royce by working at the Ricart car wash, yeah. Now that you can’t get that song out of your head, Renier is proud to announce our first project with the Ricart family of dealerships. We’ve recently begun a new car wash addition at the Columbus Mega Mall location to address their growing customer needs. Ricart is a new and used car dealership, with seven brands on site, situated on the 67-acre Ricart Mega Mall in southeast Columbus. The Ricart family has been serving the Columbus area since 1953. Renier recently completed the much anticipated MPW Industrial Services hangar at John Glenn Columbus International Airport. It’s just one of the three privately owned hangars at the airport. The 56,000 square feet two-story facility on the north airfield is owned by MPW, and a portion of it is leased out to a corporate client. The hangar includes office space and provides direct access to the airport. View more pictures of this exceptional new hangar here. 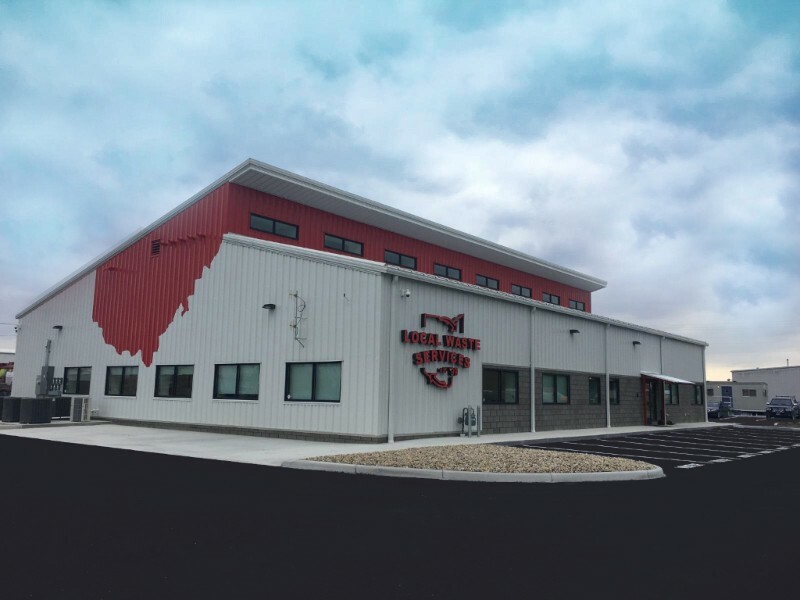 When Renier began building the new corporate office headquarters for Local Waste Services last year – they began a single project that has since turned into two additional projects there. As the original 10,000 sq. foot headquarters neared completion, owner Rick Cattran contacted Renier about other additions, specifically a Service Bay addition and a Truck Wash Bay. The Service Bay addition serves as a maintenance facility for the CNG trucks which require a specialized location for service due to the natural gas component. The Truck Wash Bay gives Local Waste an economical and effective way to keep their trucks in excellent condition, presenting the best image to their customers. While the Truck Bay project is still in construction, we couldn’t wait any longer to share this spectacular shot of the completed headquarters! With a fall completion schedule, the Albany Business Commons features a new satellite office for Licking County Title Office. 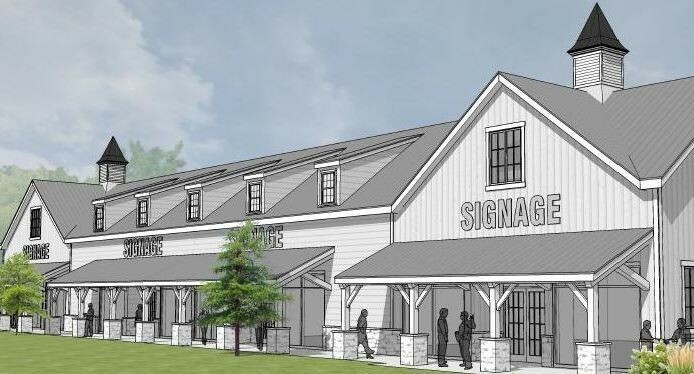 Renier is building the new retail & office space in western Licking County. It will house between two and five tenants with a total of 9,000 sq. ft. and is situated across from Liberty Chrysler Jeep Dodge Ram in Jersey Twp. on Worthington Rd. near Mink Rd. & SR 161. Over the past quarter, team Renier has said “Hello, Hello Again and Farewell & Good Luck!” to several team members. 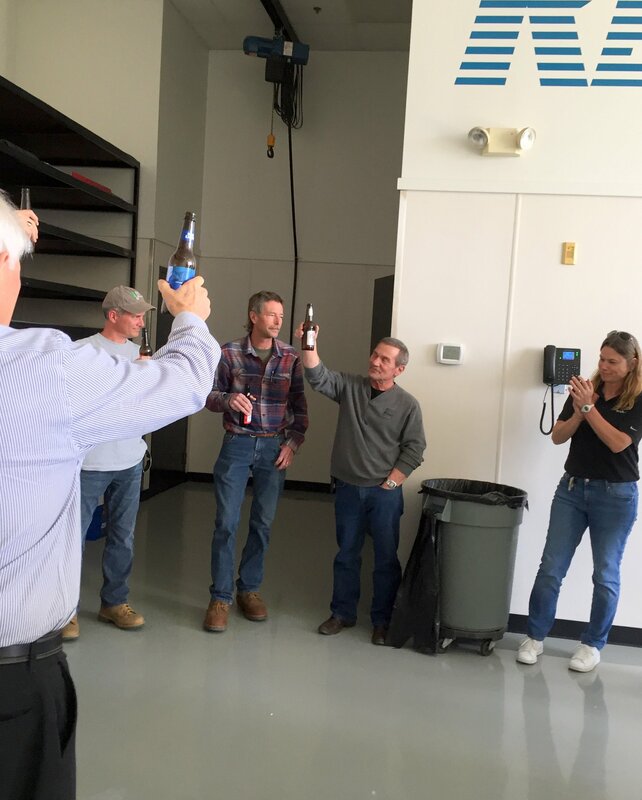 The team celebrated growth with three new hires, two returning team members and a promotion. 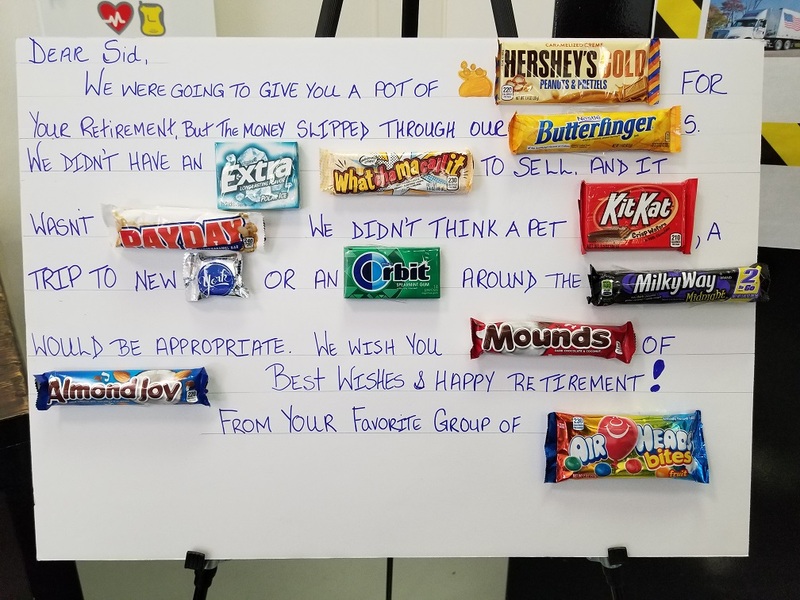 Two Renier team members hung up their hard hats to enjoy retirement. We wish them all well! Amy brings over 10 years of construction experience to the Renier team as a Project Manager/Superintendent on various builds across the United States, and has also run her own company doing the same. She holds a degree in Construction Management from Westwood College. Amy extends her skills to numerous volunteer organizations as well. Tim recently joined team Renier as an on-site Superintendent for an out of state project. He brings over 25 years of industry experience with him, from large commercial projects to smaller residential ones. He is a graduate of Ferris St. with a Bachelor of Science in Construction Management and is also a veteran, serving with the Michigan National Guard for many years. Brian comes to Renier with an extensive and diverse background in the industry, working on projects across the United States and Europe – with budgets upward of $200 million. He’s managed projects from fast track retail renovations to multi-story commercial structures to historically protected European buildings. His responsibilities as a Project Manager include managing all aspects of the job including schedule, quality, costs and client relations. Brian is a graduate of The Ohio State University with a Bachelor’s of Science in Civil Engineering and is actively involved with the university’s Civil Engineering Alumni association as well as with the United Way of Central Ohio and Pelotonia. You can read more about Brian here. Ted formerly worked with Team Renier as a Project Superintendent from 2005-2011 before taking time to expand his own construction company with a staff of 10 employees. His background with Renier, combined with his extensive and wide-ranging experience in construction, job site safety & subcontractor knowledge made bringing him back and easy choice. He and his family enjoy participating in numerous outdoor activities from skiing to mountain biking. We’re very happy to have Ted back with us! Bob brought his over 20 years of construction experience to Renier for a couple large projects in Minnesota in 2013 and then traveled to other locations for Renier as well. He’s returned to be the onsite Superintendent on another out of state job site for us. Welcome back Bob! William began with Renier as an intern in January of 2016 while completing his Construction Management degree. He became a full time team member after graduation in June of the same year as a Project Superintendent, where he managed all aspects of projects while on site. In his new position as Project Manager, he’s responsible for accomplishing all of the project objectives from building design through project completion, as well as providing supervision and direction at the job site. Prior to joining Renier, William served in the United States Marine Corp. for four years, including serving two tours in Afghanistan. William was decorated with several medals for his honorable conduct and overseas service. You can read more about William here. 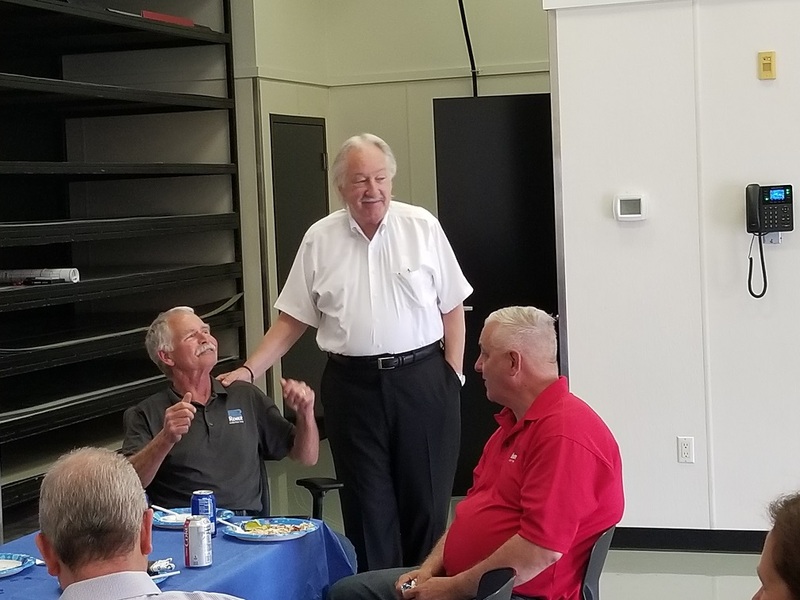 Sid Robbins – A team member of Renier since 2014, Sid concluded his 38 year career in construction with Renier and will be greatly missed by our team as well as our clients. Some of you may have noticed a cardinal sneaking in to some of our company photos (he’s even been on a magazine cover!). Take a look at this photo; do you see the cardinal? Well, he’s traveled all over the country visiting job sites, been “kidnapped & held hostage” and racked up so many frequent flier miles we’ve lost count! But sadly, he’s never really had a name. The cardinal has been in the Renier family since 2015 and we need your help to properly name him/her before s/he takes flight again. If your name recommendation gets selected, you will win a $100 gift card to Cameron Mitchell restaurants! Submit your name on our Facebook page before October 31, 2018 at 11:59 pm. The winner will be announced in the next Renier Blueprint!